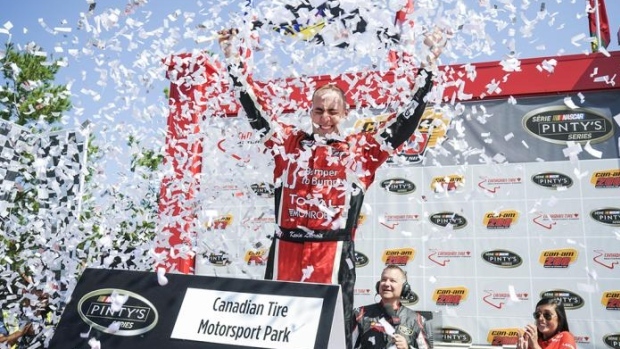 BOWMANVILLE, Ontario, Canada – In his first three starts at Canadian Tire Motorsport Park, Kevin Lacroix couldn’t even finish the race. He finally made it to end of the contest in Sunday’s Can-Am 200 at the 2.459-mile road course, and did so in winning fashion. The Saint-Eustache, Quebec, native seized the lead on pit road and maintained it for the final 27 circuits, pulling away from two-time CTMP winner L.P. Dumoulin for the fourth victory of his career and his second in the last three races. Lacroix's No. 74 Bumper to Bumper/Total/Go Fast Dodge crossed the finish line 3.871 seconds ahead of Dumoulin. The other big winner Sunday was 16-year-old Cayden Lapcevich, who finished third. With his seventh top five in 10 starts, Lapcevich extended his championship points lead to 30 over Ranger with two races remaining. Ranger, a three-time winner at CTMP, finished 21st due to a blown engine on Lap 23. The final two races of the season – Sept. 10 at Autodrome St-Eustache in Quebec and Sept. 17 at Kawartha Speedway in Ontario – are both on ovals. Lapcevich hasn't finished worse than third in five oval races this season. Robin Buck and defending race winner Jason Hathaway rounded out the top five at CTMP Sunday. Gary Klutt finished sixth, followed by Peter Klutt, D.J. Kennington, Kerry Micks and Brett Taylor. Starting from the fourth position, Lacroix quickly worked his way to the front, passing pole sitter Alex Tagliani for the lead on the 13th lap. He led the 14th lap as well, before giving the point position to Dumoulin. Tagliani, who won the E3 Spark Plug Pole Award Saturday, and led the first 12 laps before losing his power steering, then subsequently being penalized by speeding on pit road. He finished six laps down in 17th. Lacroix moved up to third, eight points behind Ranger. Lacroix is three points ahead of Dumoulin and eight in front of Tagliani. The Can-Am 200 will air on TSN2 on Sunday, Sept. 11 at 2 p.m. ET, and on RDS2 on Tuesday, Oct. 4 at 7 p.m. The NASCAR Pinty’s Series returns to action in two weeks for the St.-Eustache 250 at Autodrome St-Eustache.